Observation - Caterpillar - UK and Ireland. Description: A pale brown caterpillar, about as long as my little finger but not as thick, on rushy grass. 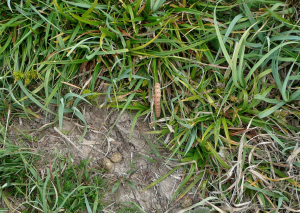 A pale brown caterpillar, about as long as my little finger but not as thick, on rushy grass.